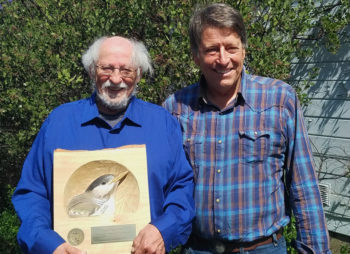 Partners in Flight (PIF) Awards recognize exceptional contributions to the field of landbird conservation in the categories of investigations, lifetime achievement, leadership, public awareness, and stewardship. 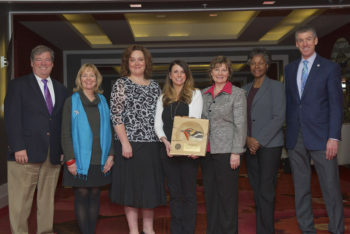 Alexis Grinde (middle, holding award) and Linda Parker (to the right of Alexis) receive a 2016 PIF Investigations Award on behalf of the Western Great Lakes National Forest Bird Monitoring Group, at the North American Wildlife & Natural Resources Conference. Others pictured, from left to right, include Bob Ford, EJ Williams, June Shoemaker, Leslie Weldon, and Rob Harper. Photo by Sean Kelley. 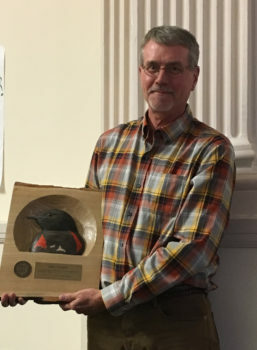 Greg Shriver receives a 2016 PIF Investigations Award on behalf of the Saltmarsh Habitat and Avian Research Program (SHARP) at the North American Wildlife & Natural Resources Conference. 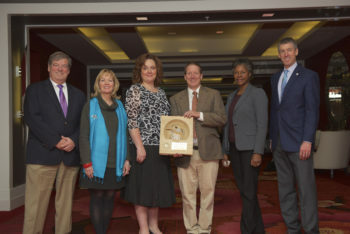 Pictured, left to right, are Bob Ford, EJ Williams, June Shoemaker, Greg Shriver, Leslie Weldon, and Rob Harper. Photo by Sean Kelley. demographic rates of tidal-marsh obligate birds in the Northeastern U.S.
of the U.S. over a period of 20 years. through leadership, investigations, public awareness and/or stewardship activities. 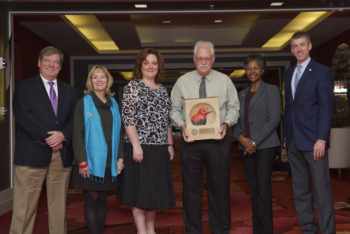 Greg Butcher (left) receiving his 2016 PIF Lifetime Achievement Award at the North American Wildlife & Natural Resources Conference, with EJ Williams (right). Photo by Sean Kelley. David DeSante (left) with 2016 PIF Lifetime Achievement Award, with Geoff Geupel (right). Photo by Lauren Helton. David Pashley recieved a PIF Lifetime Achievement Award in 2016. Brad Jacobs receives his 2016 PIF Lifetime Achievement Award at the North American Wildlife & Natural Resources Conference. Pictured, left to right, are Bob Ford, EJ Williams, June Shoemaker, Brad Jacobs, Leslie Weldon, and Rob Harper. Photo by Sean Kelley. For a lifetime of bird conservation across the Western Hemisphere. 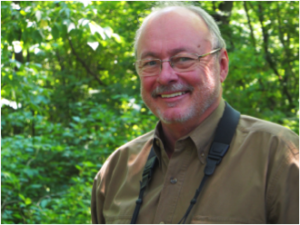 as founder and Executive Director of The Institute for Bird Populations (IBP). since PIF was formed in 1990.
in the Midwest, nationally and internationally. 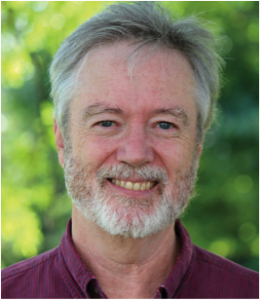 George Fenwick received a 2016 PIF Leadership Award. Dave Krueper accepting his 2016 PIF Leadership Award at the PIF Western Working Group Meeting. Photo by Janet Ruth. 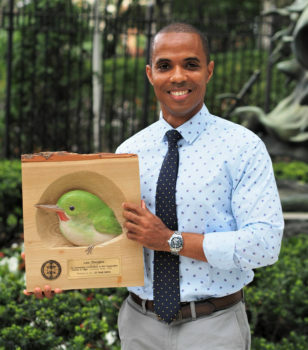 Leo Douglas with his 2016 PIF Leadership Award, presented in absentia at the BirdsCaribbean Conference. 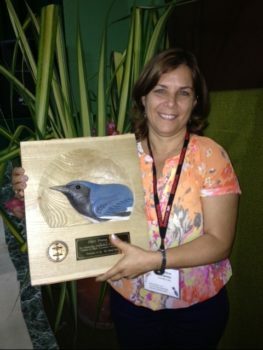 Alina Pérez Hernández accepting her 2016 PIF Leadership Award at the BirdsCaribbean Conference. Photo by Carol Beidleman. President of the American Bird Conservancy (ABC). arid western U.S., the southwestern U.S., and in northwestern Mexico. 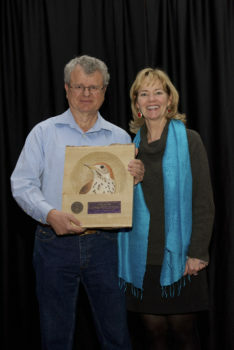 For his exemplary leadership in the conservation of Caribbean birds. For her international landbird conservation leadership in the Gulf of Mexico region and beyond.